We are getting closer to the official start of the four month-long south-west monsoon season which will commence from Wednesday, June 1. 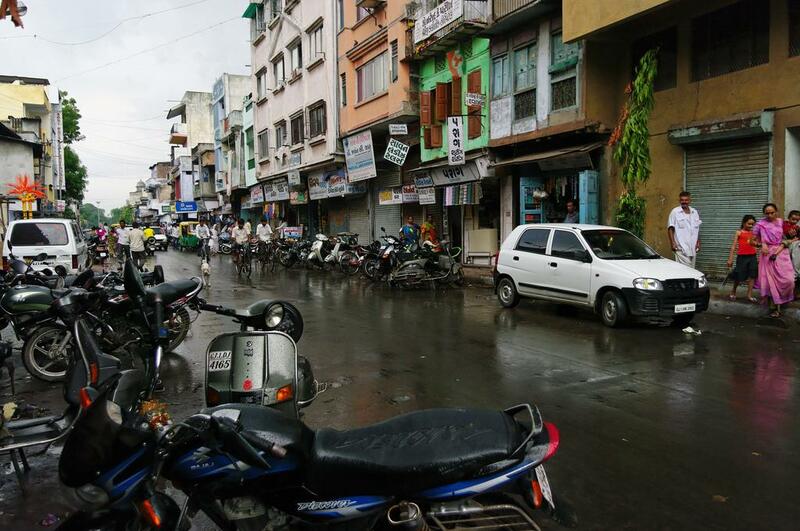 Unlike previous monsoons, this time, the anxiety is more because of insufficient rainfall in the last two years. For a country having total water storage in its major reservoirs below 19 per cent and just 1 per cent in a region like Marathwada, every single day of the monsoon season is going to be vital this time. Just last week, the monsoon made a strong and on-time arrival in the Andaman and Nicobar Islands which was expected. On May 18, the monsoon reached the Nicobar Islands and within two days it arrived at the Andamans. As per the India Meteorological Department (IMD), at present, the Northern Limit of Monsoon (NLM) passes through the co-ordinates 5.0°N, 86.0°E; 8.0°N, 87.0°E; 13.0°N, 91.0°E and 16.0°N, 95.0°E which is represented by a green curve in the above image. Usually, we think that an on-time arrival of the monsoon in the Andaman and Nicobar Islands is a good and promising sign of not only an on-time arrival in Kerala but also an overall good monsoon rainfall. Of course, an on-time arrival in the Andaman and Nicobar Islands is a sign of "healthy" monsoon circulation but you never know when its health deteriorates. That is why there is no certainty of the monsoon arriving on time in Kerala if it has arrived on time in the Andaman and Nicobar Islands. In fact, there is no strong co-relation between these two events. According to the normal timetable of the monsoon, its next destination after the Andaman and Nicobar Islands is more areas in the Bay of Bengal and countries like Myanmar and Sri Lanka where it arrives on May 25. After that, its next stop is Kerala which is on June 1. But not many people know that at the same time, monsoon reaches parts of Tamil Nadu, Andhra Pradesh, Bangladesh, Meghalaya, Assam and Manipur. 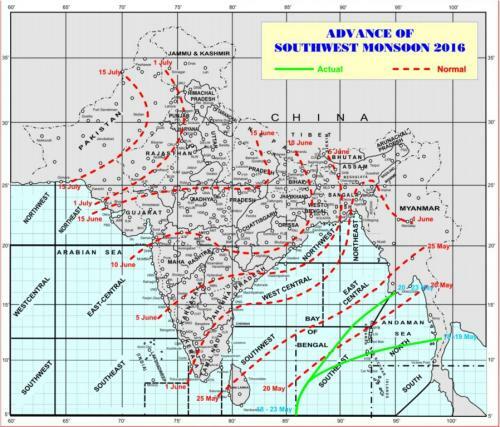 In fact, as per the above image showing the monsoon’s timetable, it arrives in Mizoram and Tripura before reaching Kerala. This time, the "pulse" of the monsoon seems to have gone down since May 20. Although it has continued to be active in the Andaman and Nicobar Islands, its progress seems to have been stalled. There isn’t any set of criteria for declaring the monsoon’s onset in Sri Lanka and Bay of Bengal. But meteorologists look for the onset signs which include sustained and well-distributed rainfall, strong westerly or south-westerly winds in a large part of the troposphere (lowest part of atmosphere where weather systems exist), cloud cover, amount of moisture etc. Weather models suggest the possibility of thundershowers in this week in some parts of Sri Lanka such as Colombo and latest satellite images show some clouds west of Sri Lanka. As a result, some forecasters are of the opinion that the monsoon will arrive in Sri Lanka on time. However, the distribution of forecasted rainfall in Sri Lanka isn’t proper and many areas such as the northern parts are expected to stay dry. The orientation of winds suggests that monsoon’s onset in Sri Lanka is going to be delayed by a couple of days and an onset around May 28 can be expected. Weather models also show increasing precipitation in parts of the Arabian Sea, Kerala and South India this week. Just like Sri Lanka, some are expecting the monsoon’s early or on-time onset in Kerala i.e by the end of May. This is contradicting with the onset window of June 3-11 given by IMD. So, how can the monsoon make an onset in Kerala at two times and on two different dates? This clearly means that one of these two dates is a "bogus" one while the other is a correct date. Let’s find out why the weather forecasters have been divided over the onset date which is confusing the citizens especially the farmers. A major mistake which we often make is that we think the monsoon is all about rain. There is a general tendency of attributing any rainfall event around June 1 (which is the normal onset date in Kerala) as a monsoon rainfall event. In many cases, presence of dark clouds and strong westerly winds, along with heavy rains, lead us to think that the monsoon has arrived. But one needs to understand that monsoon is an atmospheric circulation so the atmospheric components (such as wind speed and direction) are equally important. Hence, not every rain is monsoon rain. This is not the first year in which people are confusing between this type of rain (i.e pre-monsoon showers) and actual monsoon rain. In the past too, there have been many events during which it appeared as if the monsoon had arrived in Kerala, whereas in reality, it had'nt. A classic case took place on May 16, 1972 when IMD declared the monsoon’s onset in Kerala. Around this date, there were heavy rains in the region along with strong, near-surface westerly winds. However, very soon the IMD issued a correction stating that it wasn’t a proper onset but a temporary onset in the region. Then, on June 18, when the conditions became proper, the monsoon’s onset in Kerala was declared. In 1995 as well, monsoon-like conditions were observed in Kerala around mid-May but by the end of May, they disappeared. There have been at least six such known occurrences of temporary onset in Kerala which were during 1967, 1972, 1979, 1986, 1995 and 1997. An onset in Kerala is said to be bogus when atmospheric conditions resemble the monsoon but are improper and short-lived. The IMD has a criteria for declaring the monsoon’s onset in Kerala which gives equal importance to rainfall and winds. In addition to this, an important identification of the monsoon’s arrival in Kerala is the presence of well-defined and strong cross equatorial winds. These cross equatorial winds are an integral part of the monsoon circulation. They transport moisture from the Southern Indian Ocean to India. They blow across the equator and earth’s rotational effect changes their direction after crossing the equator, hence the name "cross equatorial winds". The left part of above figure shows proper, "C shaped" cross equatorial winds (circled red) around June 5, 2015 when the monsoon had arrived in Kerala. The right part of the image shows present situation in which there is an absence of "C shaped winds", thus indicating an absence of proper cross equatorial winds. Such bogus monsoon onsets generally occur in the month of May, during the years when the monsoon is going to be delayed in Kerala. Any strong low pressure in the Bay of Bengal (such as a tropical cyclone) attracts the winds (such as from Southern Indian Ocean and Arabian Sea) towards itself. This leads to an increase in the winds in the Arabian Sea and Bay of Bengal thereby leading to illusionary monsoon-like conditions. However, after this low pressure disappears, these conditions also disappear. Last week, the Bay of Bengal witnessed a Tropical Cyclone named Roanu. It moved along the east coast of India and made landfall in Bangladesh on May 21. Its presence has lead to an increase in westerly winds all over the Arabian Sea and Bay of Bengal, thus creating monsoon-like perturbations. These perturbations are the main reasons of a disagreement among forecasters regarding the monsoon’s onset dates. A cyclonic circulation (low pressure) will form at an altitude of around 20,000 feet over the Central Arabian Sea. As a result of this low pressure, precipitation will commence in the central Arabian Sea along with the western coast of India. In addition to this, the thundershowers expected in parts of Kerala, Tamil Nadu, Karnataka, Andhra Pradesh this week are pre-monsoon showers. As per the models, the cross equatorial winds aren’t going to strengthen and organise (to the required extent) in the remaining days of May and hence it is unlikely that there will be an early or even timely onset of the monsoon in Kerala. 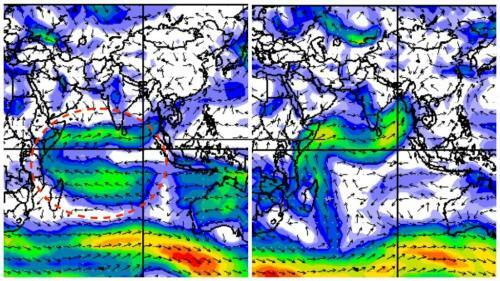 According to the long range models, these winds will properly organise after June 3 and depending on the rainfall activity at that time (which is difficult to forecast now), the monsoon will reach Kerala most likely in the second week of June. The exact date will become clear once June commences. This can cause some delay in the further progress of the monsoon, especially in Central India. It will be too early to comment on the onset picture in North India. But high temperatures and some heat waves are expected to continue in the plains of North India, Central India and parts of East India in the remaining days of May.